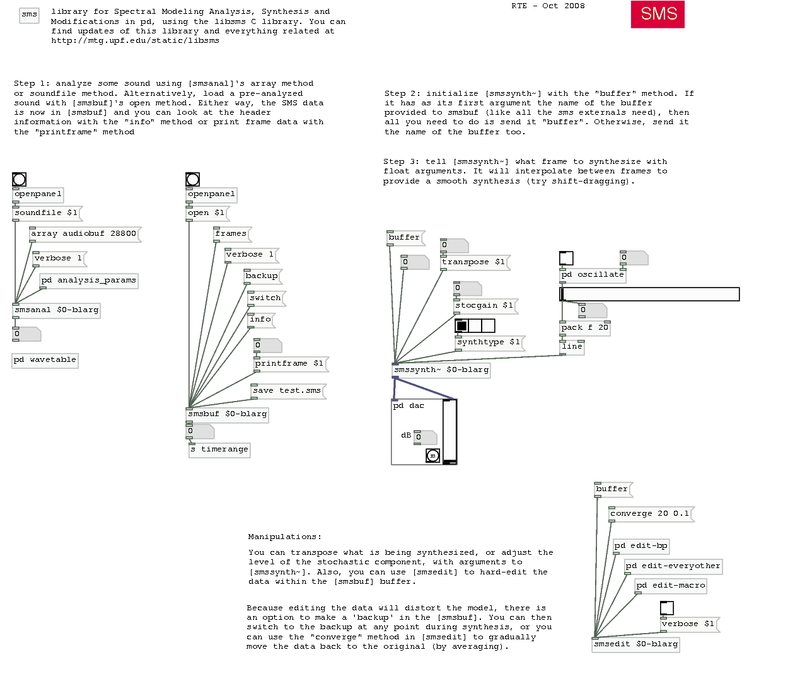 libsms in an open source C library that implements SMS techniques for analysis, transformation and synthesis of musical sounds based on a sinusoidal plus residual model. It is derived from the original code of Xavier Serra, as part of his PhD thesis. The goal of this library is to organize the many different components of SMS into an efficient, open, and well-documented architecture that can be utilized by various software systems within their own programming styles. See the library documentation below. Removed FFTW3 library and now just use OOURA - it is slightly slower but the code is 5x cleaner. Who knows, maybe one day it will be back. sms-help.pd -- here is an image of the main helpfile, which should give you a good idea of the set of externals that are currently implemented. Please read the included README and email anything you like.